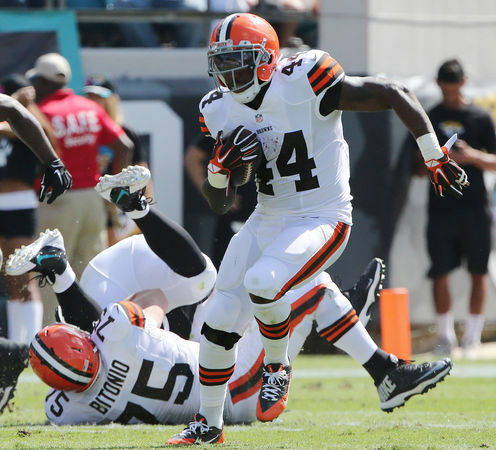 It what was a surprise – at least to us – the Cleveland Browns released running back Ben Tate on Tuesday. In eight games with the Browns, Tate rushed for 333 yards and four touchdowns, which, interestingly enough, were as many touchdowns as the Browns rushed for as a team in 2013. Tate’s rushing yards were a bit inflated by his 124-yard performance against Tennessee; take away that game and he was averaging just 2.49 yards per carry. On the one hand, if the Tate was going to be the third running back in the three-back rotation with Isaiah Crowell and Terrance West, and was unable or unwilling to contribute on special teams you can see why the Browns and Tate parted ways. But it is still a bit of a risk rolling into a six-game playoff push with two rookie running backs who are still learning that there is more to being an NFL player than what you do on Sunday afternoon (and one, in Crowell, who has trouble holding onto the ball). That all may be true, but Crowell and Tate are not going to help mend Alex Mack’s broken leg, or fix Barkevious Mingo’s shoulder, Jabaal Sheard’s foot or Karlos Dansby’s knee in time to help with the playoff run. The Browns may have taken a small step forward in releasing Tate; just how much of a difference it makes come game day remains to be seen. In addition to trying to help the Browns get into the playoffs, cornerback Joe Haden is busy launching his own shoe store. Haden’s store, The Restock, is scheduled to open on Black Friday, according to theshoegame.com. So if the whole playoff thing doesn’t work out for the Browns this season, at least Haden will have something to occupy his time. He may not have contributed much on the field this season, but Jason Giambi still found a way to help out his younger teammates. Giambi, who only hit .133 with two home runs and five RBI in 60 at bats this past season, is the reason the Cleveland Indians have an in-house acupuncturist to help deal with his 43-year-old body. Jamie Starkey is the lead acupuncturist at the Center for Integrative Medicine at the Cleveland Clinic, as well as the Indians’ team acupuncturist. She also offers yoga and Reiki massage. Being baseball players, Giambi’s teammates were slow to accept something new into the clubhouse at first, but he has slowly made some converts.